An Oromian coffee ceremony is a unique ritualised form of making and drinking coffee. The coffee ceremony is one of the most recognizable parts of Oromian culture. Coffee is offered when visiting friends, during festivities, or as a daily staple of life. If coffee is politely declined then most likely tea will be served. The Oromo coffee is brewed by first roasting the green coffee beans over hot coals in a brazier. 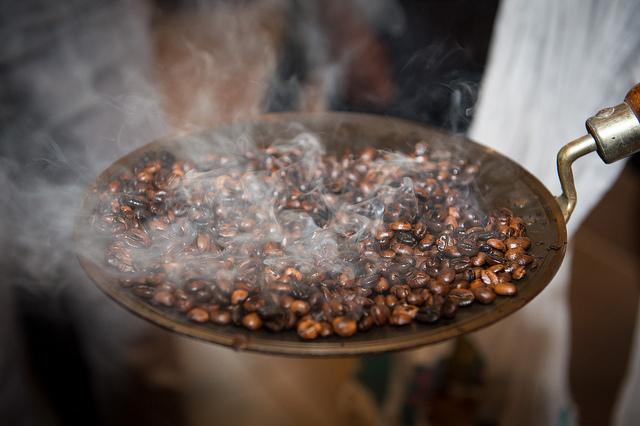 Once the beans are roasted each participant is given an opportunity to sample the aromatic smoke by wafting it towards them. 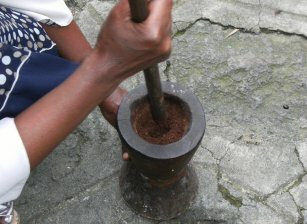 This is followed by the grinding of the beans, traditionally in a wooden mortar and pestle. The coffee grounds are then put into a special vessel and boiled. The boiling pot (jabanaa) is usually made of pottery and has a spherical base, a neck and pouring spout, and a handle where the neck connects with the base. When the coffee boils up through the neck it is poured in and out of another container to cool it, and then is put back into the boiling pot until it happens again. To pour the coffee from the boiling pot, a filter made from horsehair or other material is placed in the spout of the boiling pot to prevent the grounds from escaping. An Oromian woman pouring traditionally brewed coffee into Shiinii from a jabanaa. The host pours the coffee for all participants by moving the tilted boiling pot over a tray with small, handleless cups without stop until each cup is full. Some of the coffee will inevitably miss the cup but this is done to prevent the coffee grounds from contaminating the brew. One extra cup is poured each time. The grounds are brewed three times: the first round of coffee is called abol, the second arajaa and the third barakaa (‘to be blessed’). 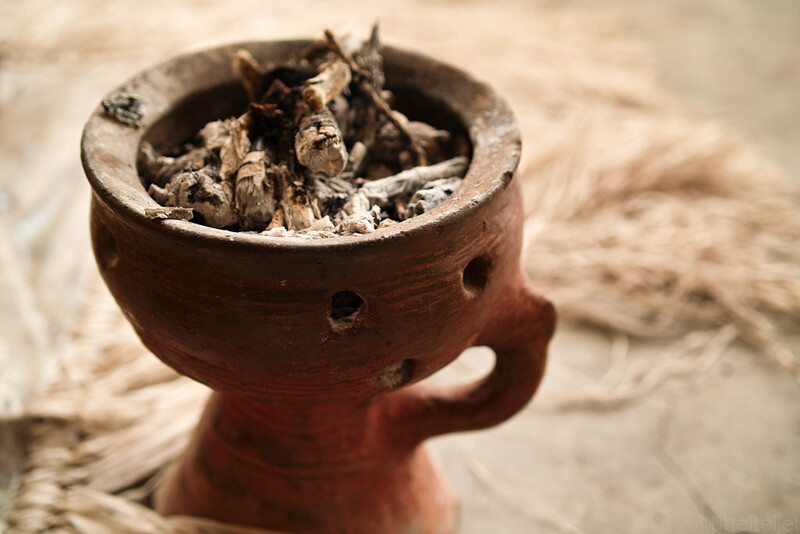 The coffee ceremony may also include burning of various traditional incense such as frankincense or gum arabic. 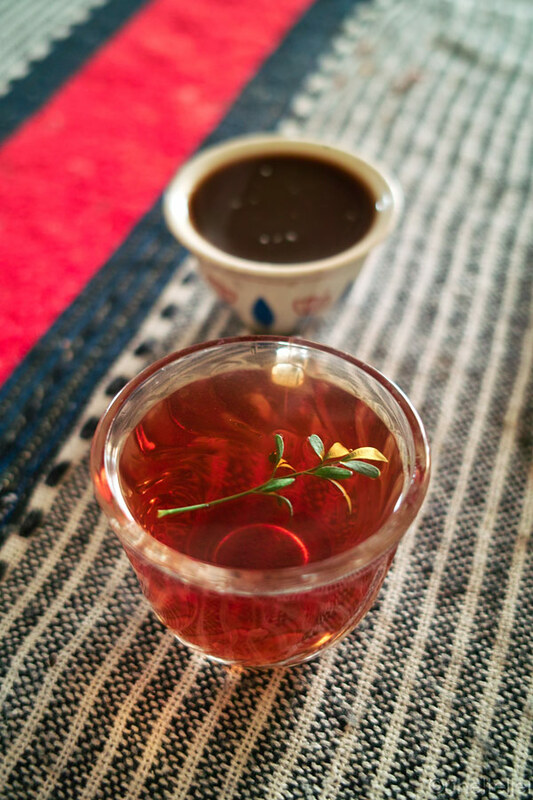 People add sugar to their coffee, or in the countryside, sometimes salt and/or traditional butter (dhadhaa baqsaa). The beverage is accompanied by a small snack such as popcorn or peanuts. Preparing coffee here is nothing like emptying a packet of 3-in-1 Nescafé into your cup and pouring some hot water over it. 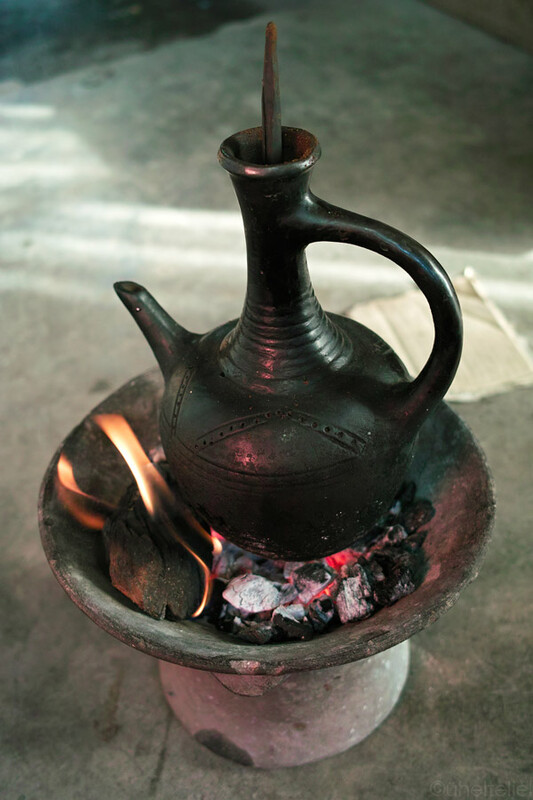 Here it involves a whole ceremony of burning incense, roasting the coffee beans (and indeed, riding around Oromia one can very often smell the sweet and smooth aroma of roasting coffee), grinding them with a mortar and boiling it with the heat from glowing charcoal. One tiny cup of the strong and aromatic elixir was enough to make us appreciate coffee without milk. Oromian coffee going strong on hot coal in Jabanaa- an Oromo coffeepot – after all, it’s the mother of all coffees. This is where that strong and aromatic elixir comes from that wakes you up in the morning or keeps you going late at night. 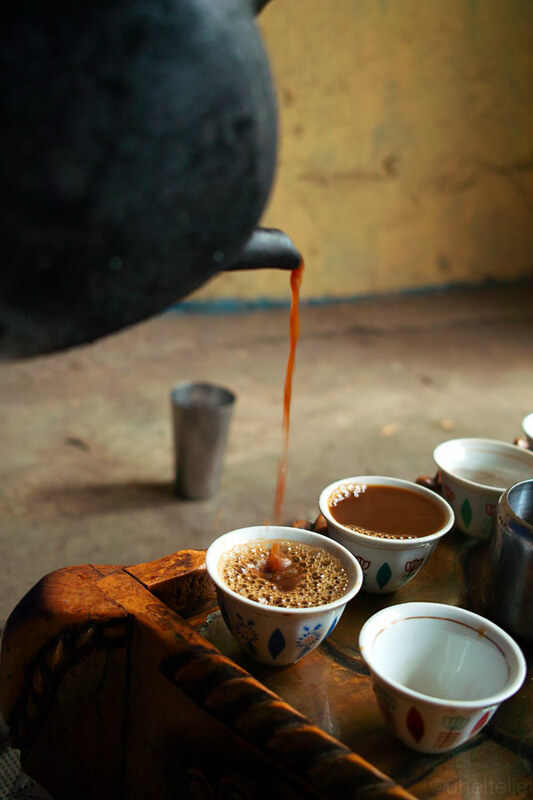 And another interesting thing about Oromia is that coffee is served together with tea, sometimes even mixed. Here tea has some sort of local medicine in it. Burning incence together with coffee is another Oromian thing – good smells go well along with coffee drinking.